SADDAM HUSSEIN’S COUSIN CHEMICAL EXECUTED IN IRAQ……. – The Tundra Tabloids……. 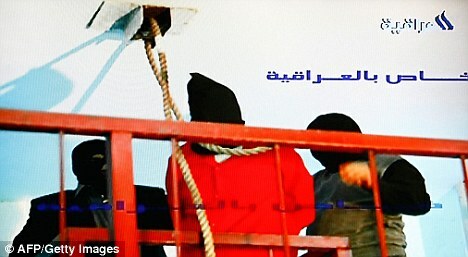 SADDAM HUSSEIN’S COUSIN CHEMICAL EXECUTED IN IRAQ……. Iraq has executed Ali Hassan al-Majeed, the brutal cousin and henchman of Saddam Hussein, for genocide and crimes against humanity. Known by his nickname ‘Chemical Ali’, the 65-year-old was hanged eight days after he was sentenced to death by an Iraqi court for ordering the gas attack that killed about 5,000 Iraqi Kurds in the town of Halabja in 1988. On his orders, Iraqi jets had swooped over Halabja and for five hours sprayed it with a lethal cocktail of mustard gas and the nerve agents Tabun, Sarin and VX. The attack brought Majeed his nickname and was repeatedly referred to during concerns over the use of chemical weapons during the first Gulf War in 1991. Saddam’s main enforcer, he also faced the death penalty for three other cases involving crimes against his fellow countrymen and genocide. Previous Post Previous Post IRAN HAS ADVANCED NUKE-BOMB PLANS……. Next Post Next Post MUSLIM OIC HEAD CALLS FOR CREATION OF THE CALIPHATE…….